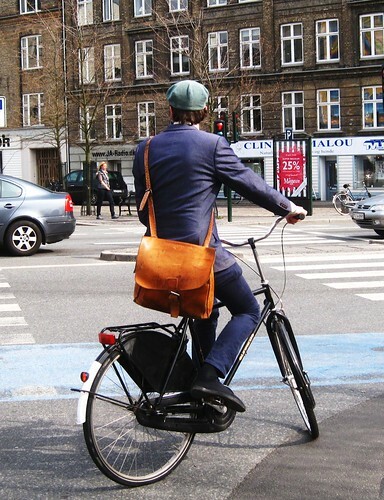 Quite often trackstanding at red lights features a big ol' U-lock sticking out back pockets of baggy funkster trousers. Nothing wrong with that, of course. In the interest, however, of showing other cycling option, I present to you the Copenhagen Dapper version of the trackstand. He hovered there like a hummingbird, a pillar of style and dapperliciousness, until the light changed. A role model for generations of Cycle Chicsters. Very, very nice! THanks for sharing! Thought you might find this interesting. Check it out. There is nothing wrong with trackstanding at red lights, if you can actually do it. There nothing worst that watching someone wobbling about at the light trying to trackstand (well almost nothing worst, sometimes it can be really funny). Ah, the memories. I was trackstanding in 1972 in downtown Montreal. I can't remember where I learned of it. Maybe I invented it. This is awesome! A classic look done so nicely on the bike. I'm quite sure that trackstanding was invented within hours of the invention of the bicycle. Love this! Wish to see more dapper chicsters around Chicago.